Today in a Manhattan courtroom during his sentencing hearing, 6ix9ine, whose real name is Daniel Hernandez, admitted that he hadn’t yet passed his high-school equivalency test. Though he risked being sentenced to one to three years in prison for failing to meet the terms of his plea deal, yet another adjournment on his case was begrudgingly ordered by judge Hon. Felicia Mennin. 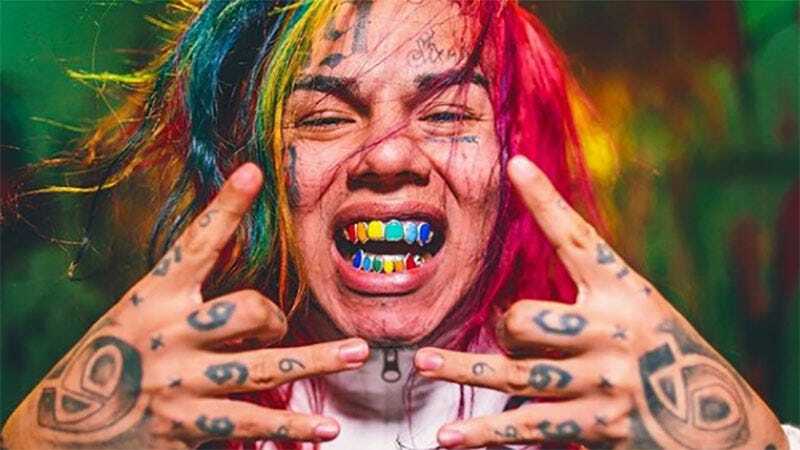 With his rainbow-colored hair piled on his head to serve a look somewhere between man-bun and Gibson Girl, 6ix9ine loomed flamboyantly in the sea of bleached wood and gray suits that is the cavernous Part 22 in the New York State Supreme Court at 111 Centre Street. He stood out like a wildflower in a desert, albeit a wildflower that had been scrawled on in Crayola markers by a toddler—the tattoos that cover his face have a faded, bleeding aesthetic that gives them the appearance of being at least as old as he is, 21. 6ix9ine wore a red hoodie, distressed acid-washed jeans, and Timberlands with a red-paisley bandana print—a bold choice echoing the Bloods-inspired imagery of his hit “Gummo” video, made bolder by the fact that he wore them to court. He showed up in the courtroom around 11:40 p.m., and was called for sentencing around 12:15. His attorney immediately requested another adjournment in a case that has already been adjourned several times because, she explained, he had trouble passing his GED. “What’s the problem?” asked Hon. Mennin, who sipped Diet Coke between hearings. She temporarily suspended the Martha Stewart-esque warm-sternness she had exhibited frequently that morning, often smiling to soften her requests and orders. To 6ix9ine, she seemed more exasperated than anything. “He’s struggled through it,” said 6ix9ine’s attorney. As 6ix9ine began to mumble an explanation as to why he has yet to complete the GED he was ordered to over two years ago, Hon. Mennin asked him to speak up. His affect was meek and softspoken—a far cry from the howling provocateur he is on stage and in his records. He explained he’d passed every section of his GED except for the science portion, which he pledged to retake. Hon. Mennin implored 6ix9ine to take the GED seriously or “you may end up going in [prison],” before begrudgingly adjourning his sentencing hearing to April 10, 2018. “One last chance,” is how Hon. Mennin referred to her ruling. In the time between cutting his plea deal and this most recent hearing, 6ix9ine has launched a rap career that, according to a four-day old Instagram post, has culminated in signing a $7.5 million contract. Yesterday, 6ix9ine announced his debut mixtape will drop February 23. In the elevator down to the ground floor, 6ix9ine, who was accompanied by two men, pledged to his attorney that he would take “mad courses” and repeatedly take his GED until he passes. As he left the courthouse, a woman stopped him to tell him that her companion wanted his autograph. Under scaffolding under the overcast sky outside the building, a young girl pushing a stroller awaited 6ix9ine’s exit. She looked to me no older than 14.